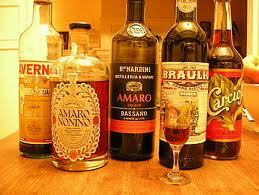 That's Amaro - By Guest Writer Tom Sandham ~ Sardinia Baby! When the moon hits your eye like a big pizza pie – or at least when you’ve eaten a big pizza pie and you’re thirsty for a digestif - that’s amaro. The moon hitting your eye is unlikely of course, and this might have some of you scratching your head, so let me follow by revealing amaro is Italy’s best-kept alcoholic secret. More discerning imbibers will know the delightful quaff and will celebrate its recent renaissance, particularly because (when the world seems to shine and they’ve had too much wine) the Italians have been smacking their own lips with amari (plural) for centuries. But for most diners in the UK, it’s a spirit that’s largely misunderstood. Now booze into gold is obviously bunkum, but even alcohol holding hands with healthy living seems a push. Yet the early successes on digestion with the herbal and root based remedies from the Greeks, Arabs, Romans and monks catapulted these elixirs into mealtime lore. Diners around this time discovered how the right mix of ingredients cured a tummy upset, and with the hefty meat dishes the medieval set enjoyed, any tonic must’ve been a Godsend. The ingredients were selected according to the geography, with amari becoming a regional speciality, so as an example the Tartufo Amaro enjoyed in Umbria was made using the local black truffles. Today other ingredients in amari range from gentian to camomile, or sage, juniper, liquorice, saffron and citrus rinds, all of them infused using various maceration techniques. Such methods are also crucial for taste, so for Meletti Amaro, coming from Marche, herbs and botanicals pass through a cold-extraction process called percolation, with alcohol poured over them to infuse the alcohol with flavours. There’s plenty of hype attached to the blend of ingredients and it figures that recipes are fiercely protected family secrets. To distinguish we rely on the tall tales of creation that imbue each bottle with the Italian romanticism that makes us swoon at the alcohol aisle. Take Amaro Montenegro, which might never have seen the light of day were it not for creator Stanislao Cobianchi fleeing the threat of becoming a priest. He found asylum in Montenegro and the country that saved his bacon also provided the key ingredient to his elixir, inspiring the name. Tiziana Cagnina, who looks after the brand in the UK claims: “The story goes that it was only after interminable sleepless nights that he could create this herbal liqueur.” It was possibly the indigestion that kept him up, that or the religious fanatics knocking down the door, either way, once he perfected his special brew he managed a decent nights kip. Elsewhere the Fernet Branca’s recipe is shrouded in mystery; was it a Swedish doctor, was it a housewife, was it the two of them together? Nobody knows, except maybe the team where it’s made. For the connoisseur the distinctions between elixirs such as amari and other liqueurs enjoyed at the beginning or end of a meal, are clear. I asked the folks in Gerrys Wine & Spirit in Soho for an opinion and they were adamant amari sit in their own category, and they should know, they sell many of them. But while popular as a digestif and a fantastic way to close an Italian dining experience, customers have also been enjoying amari before dinner on ice and Cynar, recognized for its artichoke ingredient, is a fine aperitif. This lack of imbibing rules open amari up to interpretation and with some bartenders using them as a cocktail ingredient in place of bitters, there’s occasional confusion. Added to which, Italians chose amari according to region so you’ll find the medium expressions balance sweet and bitter; light have stronger citrus notes; and fernets push boundaries of bitterness. Alex Kammerling, a bar professional for 17 years, agrees amaro is a drink in its own right, but can see why lines might blur with light vermouths or other liqueurs. This is why he hasn’t applied a category label to his recently created Kammerling’s spirit. In the traditions of amaro, the ginseng in Kammerling’s has a number of medicinal properties, and with very little in the way of innovation in amari and categories similar, it’s refreshing to see something new on the market that sits near them in style. But amaro has spent centuries earning its place as the quintessential après-dinner tipple and it’s this tradition that discerning drinkers adore. Certainly it will struggle if you chose to eat pasta from breakfast lunch and dinner, or eat an entire pig. But it’s worth remembering that, when the stars make you drool, just like pasta fazool, it’s probably time for a quick amaro to take the edge off. With orange peel, fresh coriander, red cherry, pekoe tea and cucumber notes this Bologna effort delivers a trademark bitterness but enough sweetness to make it a great entry level amaro. Salvatore Averna was given this secret recipe by Capuchin friar from Caltanisetta (try say that after a few) and its Sicilian style makes it a big favourite. Wonderfully smooth and full bodied its flowers, herbs, dried fruits, spices and licorice profile aids digestion. Served on ice as an aperitif, this is a versatile Milanese option, packed full of tummy tonic ingredients with a wonderful orange profile including gentian, rhubarb and cinnamon notes. Also perfect with a bit of dark chocolate after dinner.